The Jonas Brothers were spotted out in New York on Thursday. 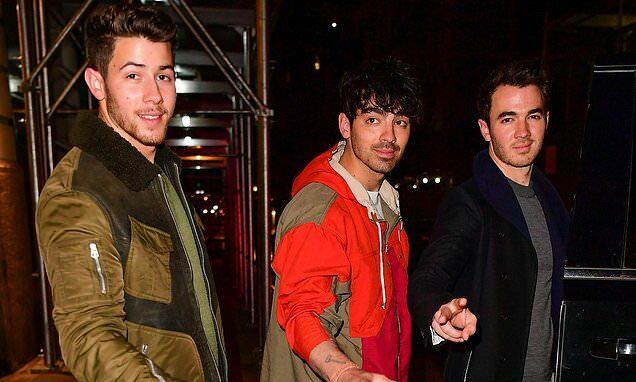 Kevin, 30, Joe, 28, and Nick, 26, bundled up in winter coats as they enjoyed a dinner out in the Big Apple. The spotting comes as the musicians are set to release their comeback single Sucker on Friday - their first new music in 10 years. The brothers posed for the camera as they rocked matching white sneakers and all gave versions of the peace sign. The album containing the single Sucker is titled JONAS. This is their first new music since 2009's Lines, Vines and Trying Times. Years & Years frontman Olly Alexander confirmed the reunion was happening after Nick let the news slip to him. A source said recently: 'This is going to be one of the biggest music reunions in years. It's no secret that things weren't great by the end of the Jonas Brothers, but blood is thicker than water and they've healed their rift in the years since the split.